Susie was rescued by a local Lab rescue who refused to leave her behind when they were rescuing the lab who was turned in with Susie. 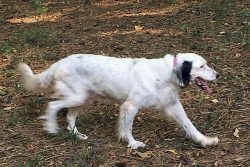 They found Above and Beyond English Setter Rescue and Susie came into A&BESR at that time. Susie has been with her foster mom since April 2016. Why so long with her foster home? Well, it has taken many months, many non invasive tests, X-rays and various diets to determine why Susie was not gaining weight and why she was having chronic. gastrointestinal issues. Susie has been diagnosed with Irritable Bowel Disease. Since starting on her new diet she has gained weight and no longer suffers chronic bouts of diarrhea. 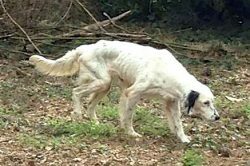 Susie came into rescue severely underweight and malnourished at 27 lb. She currently weighs 34 pounds and continues to gain weight and muscle mass. Susie's tests to determine her gastrointestinal issues have not been inexpensive and her diet is not inexpensive. Once she has gained an optimal weight for surgery, Susie still needs to have spay surgery and some masses removed. It would be ideal if she could have hip surgery for her severe dysplasia, but her foster mom is happy that she is more mobile now as a result of the diet she is on which contains the supplements to help her hips. Please consider donating to cover Susie's diagnostic medical tests, which have finally allowed her to have a "normal" life, and her still-needed surgeries.